Adding characters to your level is important as this will allow you to add other important systems such as conversations which is one way to introduce story elements to your level. Note. When the characterType is virtual you do not need to add a prefab or spawn-point. enemy bigGuard,hugeGuard,drone All of the guards listed require the character type enemy. These will allow you to add guards to patrol your level. 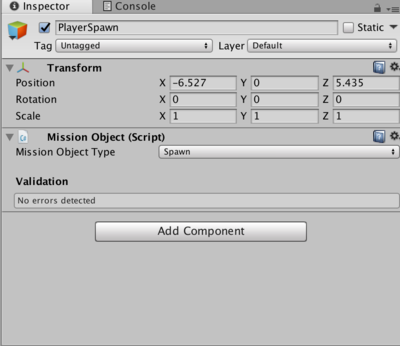 player player This will allow you to add a playable character to your game.There can only be one per level. 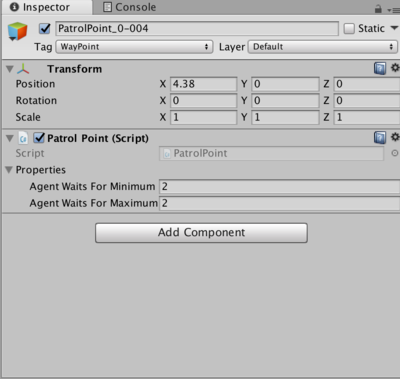 Within the Patrol point script component section you can define the maximum and minimum time a guard spends at the particular point. Repeat this process for as many points as you require. When creating a guard you can give each one a personal profile, which will effect how each guard communicates and behaves. This page was last modified on 14 February 2019, at 12:27.